Viking Valhalla! a sea angling blog | For we are the vikings, tamers of the deep. For we are the vikings, tamers of the deep. In honour of those defeated in battle. It’s that crazy time of year again, where one week we are winter fishing and the next we are off out in summer sunshine. I popped up to St Abbs today as the weather was great. I took two spinning rods and put a spinner on one and a redgill type lure on the other. The sea was as clear and as flat as it gets up there, absolutely crystal. I had a good few chunky coalies that were knocking on 2lb and dropped a real fatty off that was probs nearer 3lb. So all in all a good last day with around 20 fish, who needs bait! I was desperate to get out fishing on this bank holiday monday, the last of the year. With a nasty swell running onto the east coast rock marks catching any fish seemed difficult to say the least! I headed up the coast to Eyemouth on the Scottish East coast armed with my spinning rods, one I’d plonk out short with ragworm for bait and the other I’d use with all manner of lures. Normally the fish would be off like a shot with such a swell running but as I was soon to find out nobody told the fish! I picked a rock where I could fish high up and out of harms way, the last thing we want is to be swept out to sea by a rogue wave. To my surprise I’m glad to say it was fish after fish, mackeral by the ton along with coalies and a couple of decent pollack, all lures were good today but silver spinners probably had the edge. The other rod baited with ragworm was fairly static, no ballan wrasse at all biting, just a few small coalies that had my heart racing plucking hard at the bait. So after hours of fun and arm aching action it was time to call it a day with hope in my mind that the sea stays fairly flat for at least another month or two before winter really sets in. Tightlines, a slightly surprised angler. Well after just over a year out of the blogging scene due to setting up my new sea angling forum that’s simply called Sea Angling Reports. http://www.seaanglingreports.co.uk .I feel the time has come to get back into what I originally started and that is this sea angling blog! So please look forward to more tongue in cheek reports in the future with hopefully some good catches of fish to come. Cheers for looking in and I hope the blogging world will have me back, because here comes trouble. LOL!!! Viking Valhalla has moved to http://seaanglingreports.co.uk/ follow the link and register, many thanks! you’ll find some great new info posted on the new site over the coming months, maybe you’ll join us at our charity meets to…..make new angling buddies or just read some great sea fishing reports, it’s up to you. Here’s my report from February 2010 on what turned out to be a great shore fishing trip. For reasons beyond my control it never made it into British Sea Angling Magazines. Here’s your chance to read our cracking true story as I hoped it would be printed in the mags. It all began when Phill Dale of Skarnsundet fishcamp, Norway, joined our small but popular sea angling site in 2009. Phill posted pictures of his fantastic fishing sessions on a weekly basis, amazing all who read them with stories of large cod and huge bags of fish that he’d caught while shore fishing at Skarnsundet. A plan to join Phill and experience some of this great Norwegian shore fishing for ourselves was soon on the drawing board. After chatting to Phill on the phone before the trip it became clear that from October through to March, shore fishing for huge cod in the Trondheim Fjord area was a distinct possibility. Accounts of cod to 70lb’s caught by Norwegian fishermen in the past had us all hooked. February 2010 was the date set in stone and seven keen members of our internet fishing site were booked on the trip. None of us had ever been to Norway before and as the trip drew near the excitement that we all felt was manifesting itself in sleepless nights and day dreams of big cod . The day of the trip finally arrived and we flew out of Stansted Airport in London. Mick Cave who was on the trip is absolutely terrified of flying and his life was had by us all with tales of terrible plane crashes and premonitions of disaster. This was without doubt the funniest flight that I’ve ever experienced, poor Mick looked green with terror! A short two hour hop over the North Sea and we were soon met by Phill Dale at Trondheim airport. On arrival we were expecting blizzards and Arctic conditions but at only minus one degree and little wind it actually felt quite pleasant. A short drive through snow covered mountains with only the strange sight of a wild moose licking a road sign slowing us down, saw us all arrive safely at Skarnsundet fishcamp as evening approached. We were keen to get out fishing as soon as possible and on our first evening Phill told us we should try the small breakwater that is literally only 100 yards from the apartments. We really didn’t expect to do very well from this spot at all, surely it couldn’t be that easy, could it? The answer soon came with jumbo haddock for us all. Gregg Norris just couldn’t stop pulling them in for much of the evening with his best at 7lb, these excellent conditioned fish give a great account of themselves and are worth going to Norway just to catch alone. We all decided a wager was in order and that seventy Great British Pounds would go to the captor of the heaviest shore caught Cod. Nicky Robson hooked into the first good cod of the trip roughly two hours into our first session and after a few scary moments landed the fish, 16lb plus of prime cod was all his, not a bad first at all. We all carried on catching until the early hours with codling and jumbo haddock in plentiful supply. Phill had asked us to be ready at 8.30am in the morning for our first visit to Straumen, this caused us a huge dilemma, with fish in plentiful supply, it was almost impossible to drag ourselves away from the breakwater for an early night, close to tears we finally left at daft o’clock in the morning for a few hours sleep! The next day dawned to snow showers and to the worst weather of the trip, nothing severe though and certainly no worse than anything that we had experienced in the U.K. before. Things were however a little slow at Straumen and we only managed to pull out four codling to 4lb. Phill explained that the clarity of the water could possibly put the fish off feeding during daylight and darkness could see more fish caught. After getting a “feel” for Straumen during daylight we returned to Skarnsundet fishcamp to fish a mark Phill has named “The Landing”, here we were soon to experience just what Norwegian shore fishing had to offer. As daylight faded the place went fish crazy with double figure cod and jumbo haddock coming in all over the place, at one point four double figure cod were caught within the space of twenty minutes! Davy Tate was first to catch with a nice 11lb cod, followed quickly by Nicky Robson with another 16lb cod. Mick Cave also had two good cod in two casts, an 11lb’er and an 18lb’er which put him in pole position for the seventy quid winnings. We all carried on fishing until the early hours with haddock, codling and coalfish in good numbers making up the rest of the catch. Happy but tired we called it a night and retired to the fishcamp to dream of even better days to come. We awoke the next morning with thoughts of the evening before in our mind and to the fantastic sight of blue skies with the huge bridge that crossed the beautiful fjord in the background. Colin Green Snr who was up with the larks managed to blag himself an hour or two’s boat fishing with Phill and Colin came back with the widest smile that I’ve ever seen and the added bonus of a few nice codling for our tea. The plan today was to fish “The Landing” again into darkness and then move onto Straumen to fish over low water during darkness, fish guaranteed Phill told us and he was of course correct! At “The Landing”, again as soon as darkness descended the fish began to bite. Nicky Robson who was on fire at this point soon pulled out cod to 14lb and jumbo haddock to 7lb and in his own words, he was “fishing like a trawler”, and had the Norwegian fisheries department witnessed his catch they would have immediately slapped a fish quota on his fishing rod! Once again we all caught plenty of fish at this mark before Phill came to pick us up for our move to Straumen. Phill doesn’t normally fish with his guests due to the fact that it may not go down to well if he happened to catch a big fish and his guests didn’t. However on this occasion there was a spare rod and reel and we all agreed we’d like nothing better than Phill to join us at Straumen. Here Phill was straight into fish along with Colin Green who both pulled in a steady stream of nice haddock and codling. Nicky “Trawler” Robson was the first into a better fish which turned out to be a cracking cod of 28lb 4 ounces, beating Phill’s best ever cod by four ounces. A cast or two later for the “Trawler” and his Century Tip Tornado buckled over in it’s stand, a hard fight began, and it was touch and go as to who would win the battle. Finally though and after what seemed like an eternity the fish was at our feet. Nicky had managed to catch an outstanding shore caught cod of 48lb 7 ounces! A new record for the fishcamp and bigger than any cod caught previously from the shore in Europe! 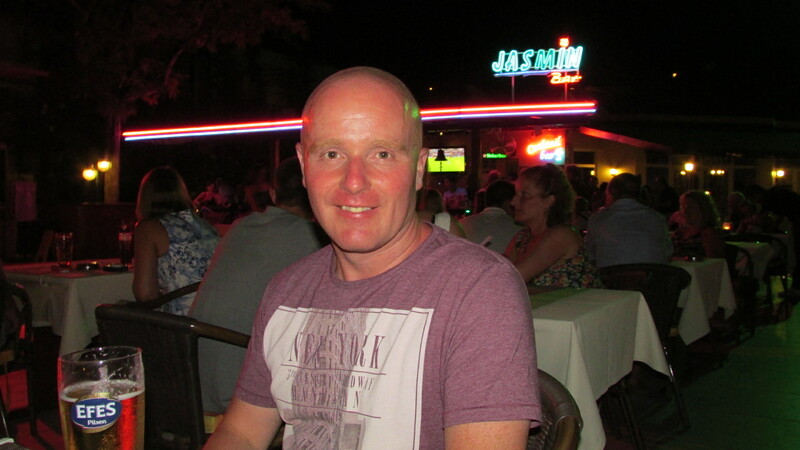 Just think in five consecutive casts Nicky had caught and released over 100lb of fish! None of us had ever seen a fish so big before and we stood around this lump of a fish in amazement, I couldn’t believe what I’d witnessed and really didn’t believe it could get much better than that, now could it? Unfortunately the evening came to an end all too soon with the onset of the strong tide that Straumen is famous for. The van was bouncing with laughter and excitement on the way back to the fishcamp, it was fantastic and none of us got much sleep that night! The next morning soon came and I’d have sworn I’d been dreaming if it hadn’t been for Nicky reminding us all time and again of exactly what happened the previous evening. Nicky was way out in the lead now and impossible to catch, or so it seemed. The plan today was always to go back to Straumen during darkness but first we hoped to find a new mark under the bridge which offered deep water and the possibility of a fish or two during daylight. Phill warned us that it was a long way down and he was right, with sweat dripping from our brow we reached the bottom and set up our gear. Davy Tate, Mick Cave and the two Colins found the hotspot and Mick pulled out another lovely haddock going well over the magic 7lb mark. We had a couple of hours here before Phill picked us up for our move back to Straumen. At Straumen I asked Nicky if he would rub my fishing rod and pass on his luck to me because although at this point I’d caught plenty of fish, I hadn’t had a double figure cod. We began to catch codling of around 4lb with Mick taking another good one of 9lb. Then it happened Nicky’s lucky rub payed off big time and the moment I’d been waiting thirty two years for came. A hard pull down on my Century Wr300 rod tip alerted me to a good fish taking my bluey bait. 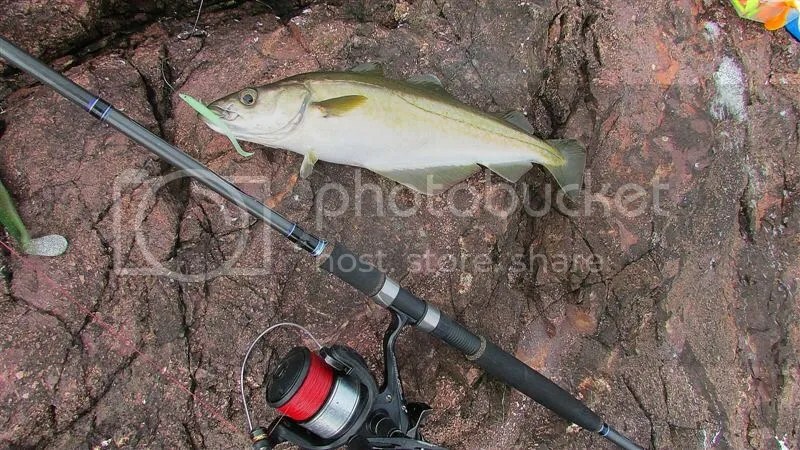 My line began to head up tide quite quickly so I picked up the rod and wound down, fish on! It was obviously big but the fish began to move fairly easily at first and it wasn’t too long before it was in shallower water. However just as I thought I’d cracked it, the fish decided to go off on two gut wrenching runs that stripped line from my reel. I got the fish moving in the right direction again and finally gained line on my reel! Adrenalin took over at this point and somehow I managed to drag the massive cod over a ledge in front of me, my two new best pals Gregg Norris and Colin Green grabbed the monster and it was job done. I’m only five foot, six inches of beer muscle and this fish was nearly as big as me! A true monster of the deep weighing in at nearly 50lb’s and just pipping Nicky to the top prize by 1lb. The winnings were mine! Even less sleep was had by us all that night and with only one more day of our fishing holiday left, how on earth could we surpass that. The lads decided on one more crack at Straumen that evening and I popped onto the breakwater in front of our apartments by myself just so I could get an early night for the trip home next day. 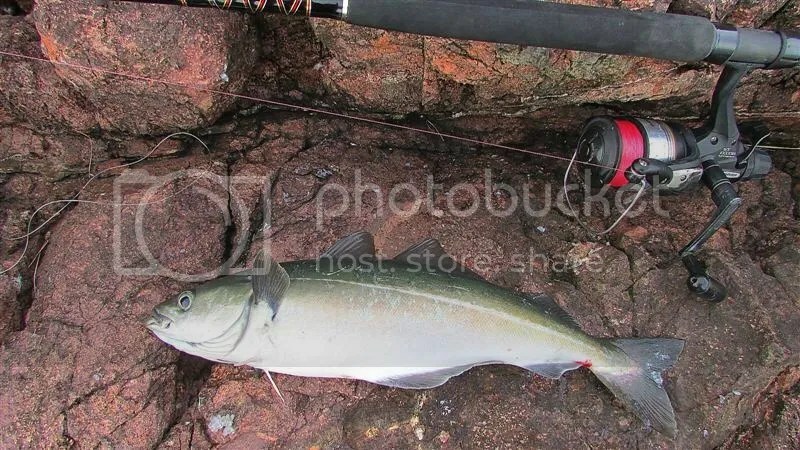 My first cast on the breakwater and a near twenty pound cod took my bluey bait, screaming for help I managed to land it and I swear my cries could be heard all of the way back to Tyneside. 19lb cod on me todd!!!! The lads came back in the early hours after catching more nice fish and with Nicky again catching an unbelievable cod of 45lb! This fish had unreal markings on it’s back that made it’s skin look like a leopard’s hide. Colin and Dave later went to look at Nicky’s 45lb’er on the shore and then turned their backs on Nicky commenting “it’s only another 40lb’er” before walking off laughing to themselves at what they’d just said. A comment I’ll remember for the rest of my life!!! Mick Cave who’s a one in a million total nutter had a naked dance in the snow with a nice cod as a dancing partner to celebrate our trip and just like Mick the rest of us all had the time our lives! Dab to 1lb 9 ounces were caught, whiting to 2lb, haddock to 7lb and cod to nearly 50lb were all caught from the shore on our trip, absolutely fantastic for us and for Phill Dale of Skarnsundet fishcamp, Norway. On a final note, fishing in Norway is a brilliant experience and I’d recommend it to anyone but what we managed on our trip was a one off and a big surprise to us all. To be truthful we each would have been very happy with one 10lb cod at the end of the trip. Personally I know I’ll probably never catch a cod as big again, but I’ll give it a go each time I head out to Norway in the future. Sadly my big fish died even though I tried for twenty minutes to revive it standing in freezing water. I was gutted about this fact at the time and it took a while to motivate myself to pick up a rod again. Seven of us went, six of us keen anglers, four of us managed double figure cod with Nicky Robson taking a double a day!!! Here’s a few more pics of an outstanding escapade in Norway. We had a day out on the boat but very little was caught, better in the summer for boating at Skarnsundet. I hope you enjoyed our true account of what happened, it’s such a shame it never made it into any of the British sea angling magazines!, anyway you read it here in the end…………..exclusively on Sea Angling Reports! 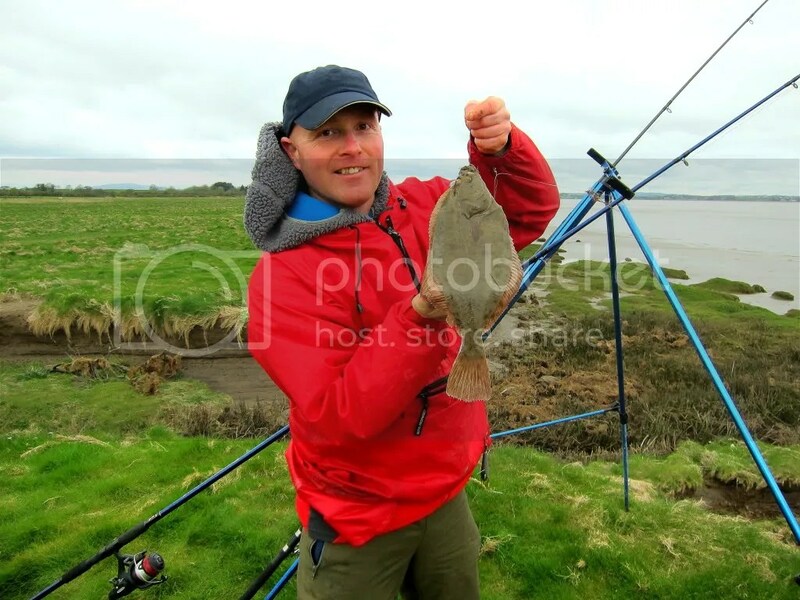 Port Carlisle: Bank Holiday Bonanza! As flounder fishing goes this place takes some beating, 63 fantastic flatties between the four of us in a couple of hours. We did use two rods each just to maximise our fishing time as time is limited on this mark due to the lack of water in the Solway towards low tide. This place rarely lets you down at this time of year and it’s hectic sport with double shots of fish common place. The tides were massive today so we were able to fish from the grass banks with ease. 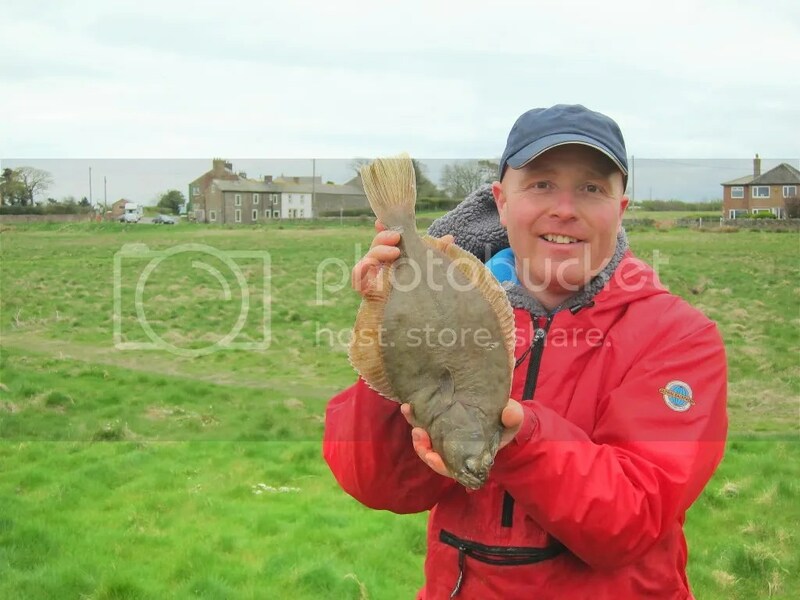 Nicky as always took top spot with 25 flounder, baits used were prawn, peeler crab and bluey. Here’s some pics for you from what turned out to be a great day! We caught some crackers to…. Well worth a look over in my opinion for some outstanding sport. 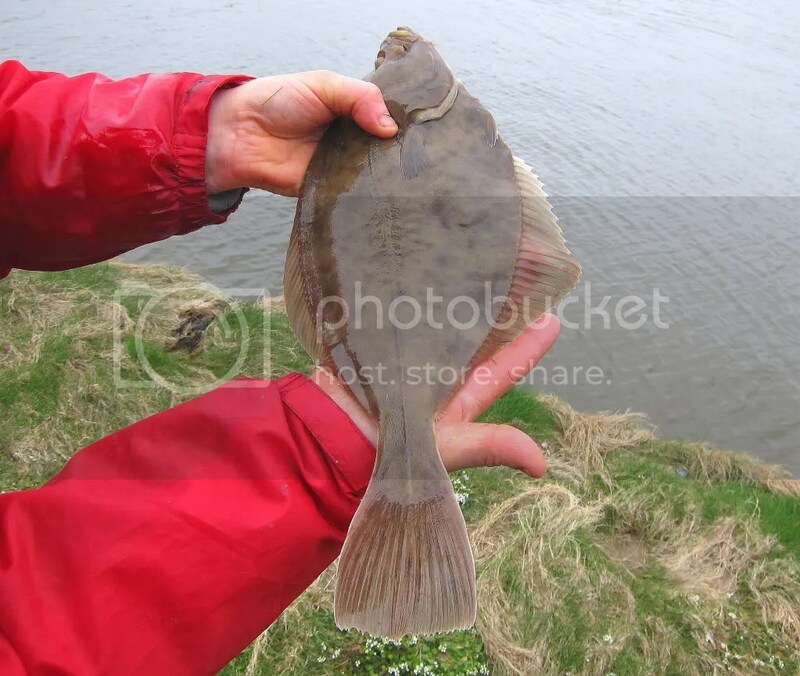 I realise that flounders are all that’s being caught at the moment by most who post on the forum but other species will be found soon, don’t worry about that. Some vids of the day….. Places to fish, tips and my personal exploits!